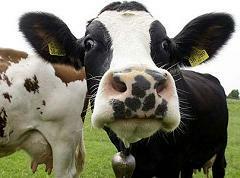 Cows naturally produce a gas called methane that can be burned by humans. Cows release methane as they chew, burp, and fart, but mostly when they burp. A herd of cows can produce up to 450 gallons of the stuff every day. Cow dung releases methane as it deteriorates, as well. What is left can be used for rich, non-smelly fertilizer. Methane is an extremely potent greenhouse gas, and much of it is produced as a result of cattle farming. Because most of the methane from cows is produced when they burp, it is not currently practical to extract methane from cattle. For the young and the young at heart, welcome to the totally cute, cuddly, and easy-to pet section. These short tidbits are a quick way to learn about many of our favorite domesticated farm animals. Just remember to wash your hands on the way out. How Much of the World’s Forests Have Disappeared and How Much Forest On Earth Is Destroyed Every Day? Which U.S. States Produce the Most Energy Resources and How Much Electricity Is Generated Using Coal? How Much Poop Does an African Elephant Produce in a Day and Why is Elephant Poop Useful?